Delicious Chicken Mushroom Alfredo Canapes recipe. Chicken, bacon and tomatoes in a homemade creamy alfredo sauce with cheese on French bread, toasted to perfection! If you enjoy these Alfredo canapes, try our Chicken Alfredo Flatbread recipe. 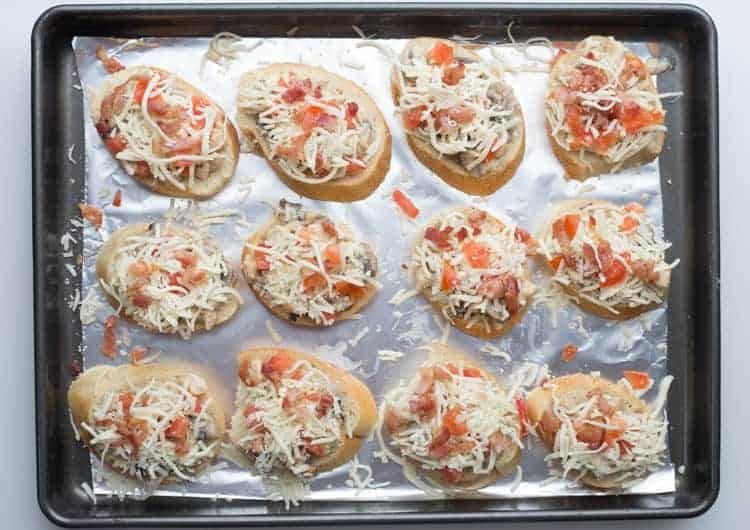 Simple canapes recipe made with chicken, bacon, tomatoes smothered in an alfredo sauce with cheese. Canapes are very popular in the Slavic community at gatherings or parties. I love them! Canapes are must-haves when I am hosting. They are so easy to make are the perfect appetizers to serve. 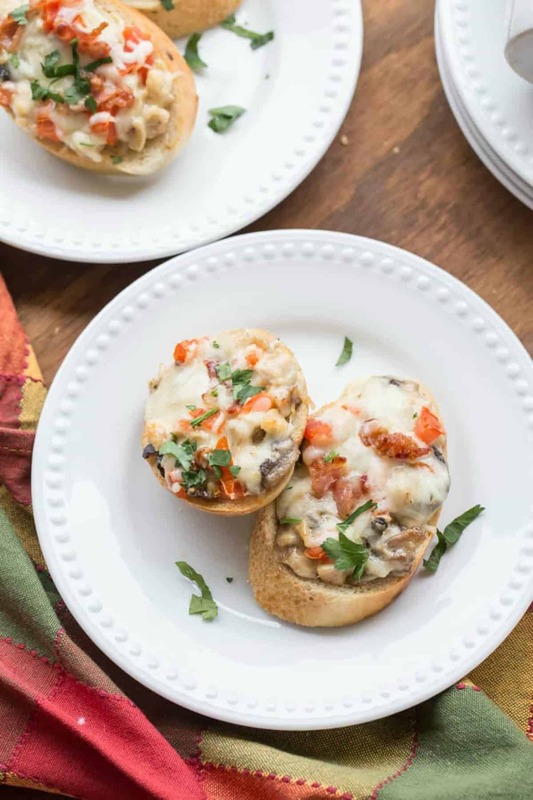 You can make these chicken mushroom alfredo canapes ahead of time. Just prepare everything and when ready to serve just prepare them and bake! Simple and great recipe for parties, lunch or as a side. Cube chicken breast, slice mushrooms and slice bacon into small pieces. Cube tomatoes. Cook chicken with oil in a skillet. Once cooked remove from skillet. 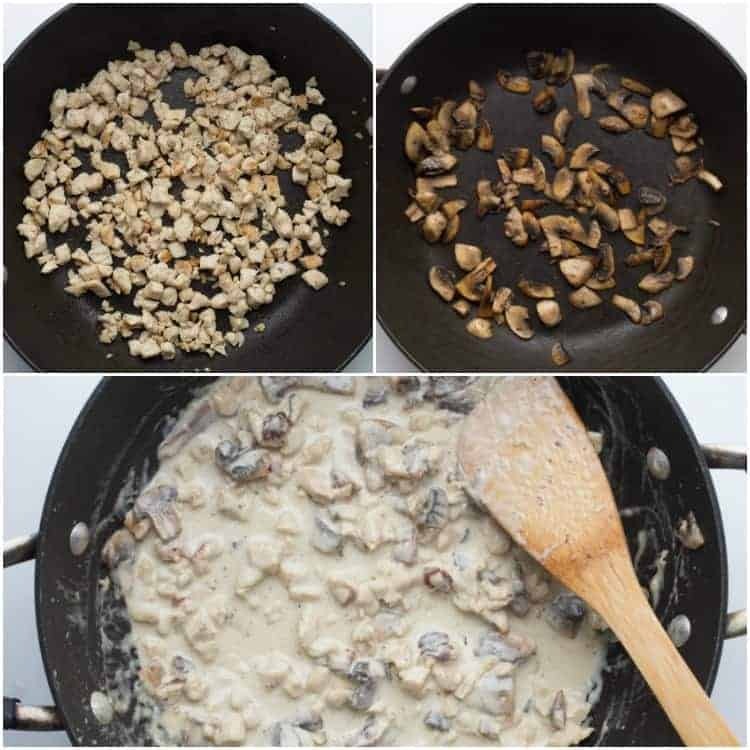 Add mushrooms and oil in the same skillet and saute until cooked. Salt and pepper mushrooms. Add garlic and cooked chicken to mushrooms. Pour heavy whipping cream and parmesan cheese, mix until well combined. Cook 3 minutes. Set aside. 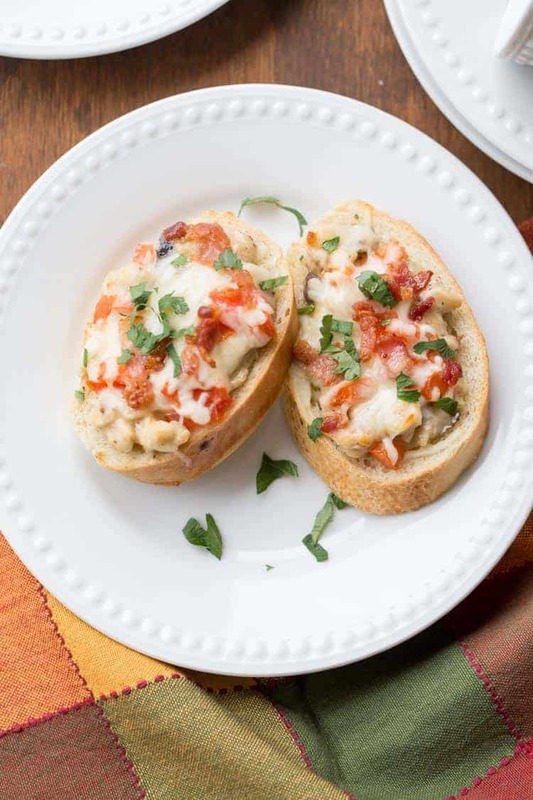 Generously spread the alfredo mixture onto each slice of bread. Top with tomatoes, cheese, and bacon. Bake at 365F for 12-14 minutes. If you make this alfredo canape with chicken recipe, don’t forget to leave us feedback in the comments below and tag us on social media, #ValentinasCorner. We love to see your creations. ? As always, thanks for being a part of our online family. 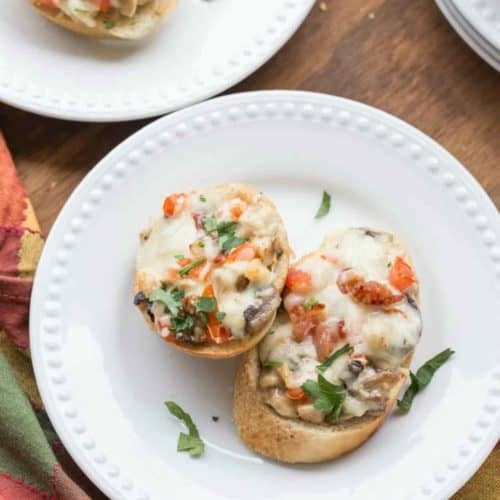 Brie Mushroom Canapes– Canapes with mushrooms and brie cheese. Chicken Spinach Artichoke Canapes– Delicious cheesy chicken spinach canapes. Avocado Canapes– Crispy bread with avocado spread and tomatoes. 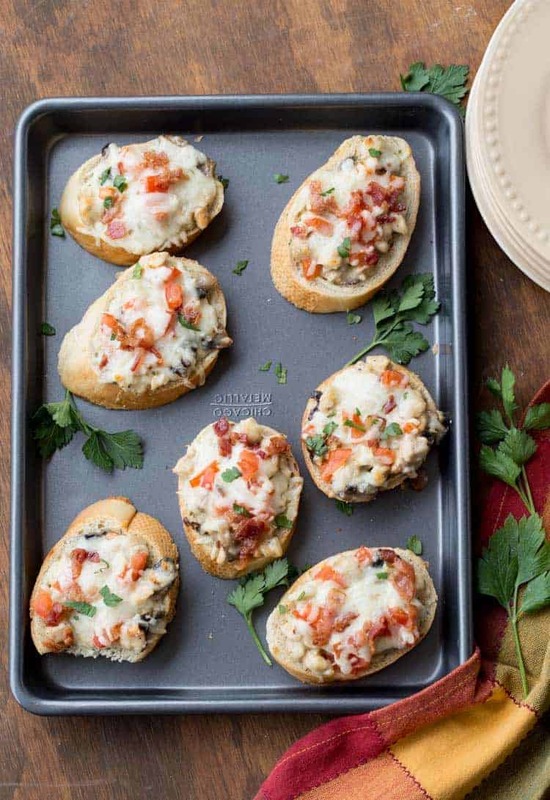 Amazing and easy Chicken and Mushroom Alfredo canapes with bacon. These open-faced sandwiches are amazing for parties. Line 2 baking sheets with foil or parchment paper (clean-up will be easier, you’re welcome). Slice bread into about 24 slices, set aside. Cube chicken. Slice mushroom (if mushrooms are large, cut slices in half). Slice bacon into small pieces. Cube tomatoes. Cook chicken and 2 tsp oil on high heat until cooked (about 5-7 min), lightly salt and pepper. Remove chicken. In the same skillet, sauté mushrooms with 1 tsp oil until golden, lightly salt and pepper. Add garlic and chicken to mushrooms, mix. Pour heavy whipping cream into a skillet, mix well and add Parmesan cheese. Turn heat down to low/medium. Stirring frequently, cook 3 minutes. Set aside to cool. Lay out the bread slices on baking sheets. Add a generous portion of the Chicken Alfredo mixture from the skillet. Add tomatoes, then cheese and bacon. Bake in preheated oven to 365°F, 12-14 minutes. Did you fry bacon before you put on canapés They look really good ? ? What temperature do I bake these at? Yum! Chicken Alfredo pasta is a popular meal at our house too. So as canapés. These look really good! Thank you Valya, they sure are delicious..? ?